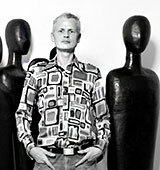 KLAUS FABRICIUS, born 1956, in Paderborn, Germany. He is involved in theories about the philosophy of paintings and how the world of pictures affects the world as a whole. Exhibitions since 1986. Lives in Stuttgart.